Students from Miami Springs High School visit FIU’s organic garden and shade house as part of the Fairchild Tropical Botanic Garden Challenge Program‘s “Environmental Immersion Day” on Nov. 9. The Challenge Program engages local high school students in multi-disciplinary environmental science education and fieldwork to motivate them to pursue careers in the science, technology, engineering and math (STEM) fields. 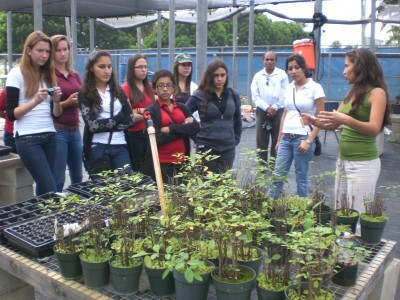 The Agroecology Program hosted the 10 high schoolers and provided lectures, workshops, lunch and a tour of campus to show them the higher education opportunities available at FIU.